Starring Mammootty in the lead role, ‘Pullikkaran Staraa’ will remind you of many of the feel good movies, which have come and hit in the past. Well, not boasting any originality in the plot, this Shyamdhar directorial can be a onetime watchable, if you are willing to shed all the expectations. Rajakumaran (Mammootty), hailing from Rajakumari, Idukki, has always been a good hearted fellow, who lands into problems unintentionally. Well, fondly called by many names, he still remains an unmarried fellow, who is pursued by women a lot. Indeed a witty and an interesting character, Rajakumaran also steals the show as a trainer for teachers. That said, he is sought after by two women in this film, and ‘Pullikkaran Staraa’ explores his life. For the sake of records, this movie marks the second directorial outing of Shyamdhar, post his ‘Seventh Day’. Having chosen a markedly different genre this time, he has opted for a slow paced narration. Though the movie deserves a kind of slowness in its narration, Shyamdhar’s approach fails miserably at most parts. The movie started off in a good fashion, with the narration concentrating more on the characterization of Rajakumaran. Having stated that he is a kind of good hearted fellow, who was mistakenly perceived by his villagers, Rajakumaran’s initial parts, contained an interesting thread to weave a decent story. Well, after a point, Shyamdhar mainly concentrated in giving a touch of wisdom to even the hair follies of Rajakumaran. Preaching about various aspects of life mostly, Rajakumaran appears too good for the movie to handle with. Intentionally or not, Ratheesh Ravi’s script followed a flat narration, without much of a surprise to offer. That is okay, but without providing a single scope for any variation, it was all about the leisure moments, which he could give, that determine the effectiveness of Shyamdhar’s narration. 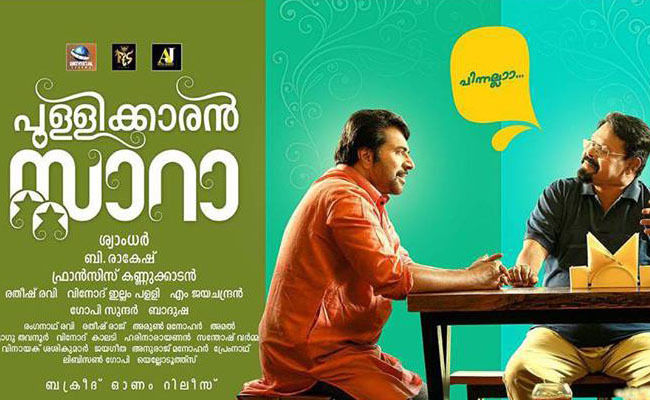 Apart from the occasional comic situations and one liners, ‘Pullikkaran Staraa’ didn’t ooze any freshness in its heart. Had it been a short trip, then the movie could have given a good experience for the viewers, who have seen umpteen flicks of this nature. Well, Jayachandran’s songs were decently good, but they actually did more harm to this already over taxed movie. However, why on earth did Mammootty was given such shucking dresses throughout the film – was it intended to match with that of his character or related to the wisdom talk of him? Only Shyamdhar knows it! Well, on the acting front, Mammootty comfortably passed Rajakumaran phase; as usual he looked unbelievably young for his age. Asha Sharath and Deepti Sati, the two important lady characters of this movie, did what the script demanded. Nothing much to state about the rest of the cast, or that of the technical aspects, which all looked usual stuffs!